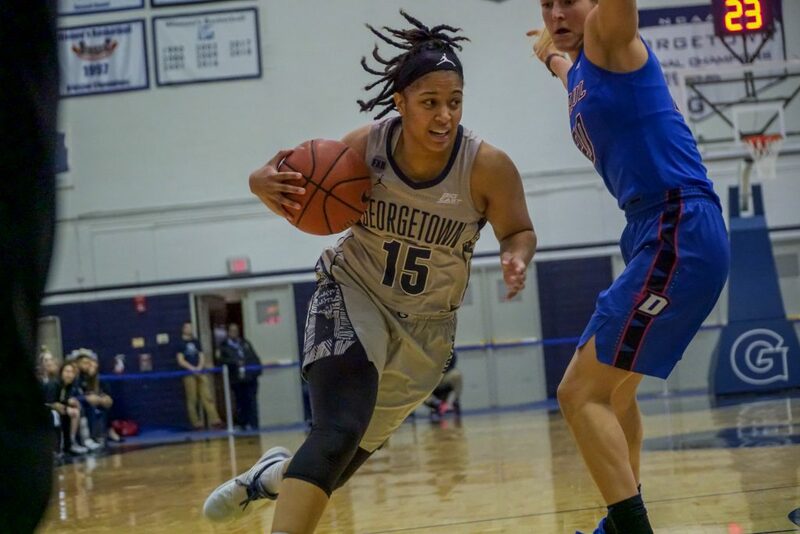 The Georgetown women’s basketball team (11-13, 5-8 Big East) fell to DePaul (17-7, 8-4 Big East) by a score of 76-71 on Sunday afternoon at McGrath-Phillips Arena. After racing out to a first quarter lead, the Hoyas ran into trouble with their leading scorers sidelined for much of the second and third quarters due to foul trouble as the Blue Demons retook the lead. 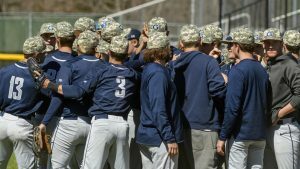 A final comeback attempt came up short as the Hoyas finished with a disappointing 0-2 this weekend despite two tough games against the cream of the Big East in Marquette and the Demons. The Blue Demons were led by junior forward Chante Stonewall’s 20 points and senior forward Mart’e Grays’ 20 points on 8-of-12 shooting from the field. Senior guard Dionna White outpaced the Hoyas with 16 points, 4 rebounds, and 4 steals, while graduate student guard Dorothy Adomako added 15 and six rebounds. Both teams came out firing in Chicago, as the first five shot attempts of the game were all 3-point tries within 1:40 of tip. Graduate student guard Mikayla Venson’s make briefly knotted things at 3-3 after DePaul freshman guard Maya Stovall opened the scoring at 9:49, but Stonewall came right back down the floor for the Blue Demons to restore the home advantage in a frantic first minute of play. Though junior center Anita Kelava hit a jumper for the Hoyas after senior guard Ashton Millender’s three, stretching the lead to six, Millender then found Stonewall underneath as GU again found themselves in an early hole. Head coach James Howard’s team got back in the game by getting on loose balls. White’s steal led to an and-one for junior guard Morgan Smith, before Smith pulled down two offensive rebounds on one possession which was culminated by a Venson jumper. Both teams found stops defensively towards the end of the first quarter, but not before White had added five points and an assist on freshman guard Nikola Kovacikova’s midrange make. Kovacikova, for her part, provided three assists in the first period, the last on sophomore guard Tatiana Thompson’s three as time expired. The Hoyas went into the break with a 26-19 lead. Stonewall scored the Demons’ first six in the second as the Hoyas went cold from the field after hitting everything in sight in the first period, and suddenly the away lead had shrunk to one, while White sat out the remainder of the frame with two fouls. The home team was making inroads—senior guard Rebekah Dahlman converted while drawing Smith’s second foul, before Thompson committed a charging foul for her second foul and third turnover of the game. A Smith layup was sandwiched between two Stonewall layups underneath, as the Hoyas seemingly had no answer for DePaul’s leading scorer without Adomako. DePaul’s sixth three of the half threatened to leave the Hoyas down five heading into the break, but GU again found a late basket on Venson’s layup with four seconds remaining. Both teams boasted gaudy shooting totals at the half, with neither below 40 percent from the field or from 3-point range. Stonewall led the game with 15 points while Stovall and Campbell both had four assists in the half—no Hoya, meanwhile, had gone over seven points. The third quarter started about as badly as it could have for the Hoyas, with White picking up her third foul on a charge almost instantly at 9:42. She would stay in the game, however, and hit a jumper to stop the bleeding after a 6-0 DePaul run opened the half. Adomako then picked up her third foul, and returned to the bench, while Thompson was called for her third foul 24 seconds later. Frustrations came to a head as Smith, along with a Blue Demon, was called for a technical foul at 6:36. 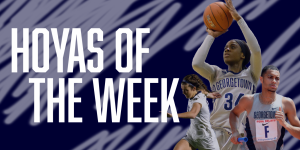 Senior guard Brianna Jones hit a three to pull the Hoyas right behind DePaul again, while Adomako then promptly connected on a jumper to make it a four-point game upon her reinsertion. White’s fourth foul stymied the Blue and Gray momentum on a day where they could seemingly never string together positive possessions after the first quarter. Making matters worse for Georgetown, DePaul joint-leading scorer Gray finally got going in the third after scoring only three points in the first half. Meanwhile junior guard Kelly Campbell, who leads head coach Doug Bruno’s team in assists by a wide margin, continued to distribute, recording her seventh assist on Stonewall’s layup that stretched the DePaul lead to nine at 1:57 in the third. Wanting to be within striking distance before the final frame, Howard then reintroduced Adomako, who drew two fouls before the quarter’s conclusion, scoring three points from the stripe. A Stovall jumper with one second remaining in the third gave DePaul a 59-51 lead heading into the fourth. Howard opened the fourth frame with both White and Adomako on the floor as the Hoyas looked to claw back into the game. Each went to work offensively right away, drawing a foul apiece and hitting all four combined free throws to bring the Hoyas within five. The 6-foot-2 Gray showcased her range on the next possession however, stroking a three to finish Stovall’s sixth assist. Two misses from Adomako and White on the Hoyas’ next two trips followed by Adomako picking up her fourth foul put Georgetown on the ropes, but neither showed any quit, as White scored the Hoyas’ next seven, assisted once apiece by Adomako and Kovacikova. Bruno called a timeout up 65-62 with 4:45 remaining. A DePaul miss was followed by an Adomako layup assisted by Jones to cut the home lead to one. Campbell’s ninth rebound was followed up by Gray underneath, however, but White’s steal of freshman guard Lexi Held led to free throws for Adomako, who converted one of two. Her second free throw was rebounded by Jones, who then hit a jumper to even the score at 67. White fouled Held for her fifth foul, while the freshman hit both free throws before finding her way underneath to twice to create a two-point DePaul lead after Adomako knotted things again off an assist from Venson. With the Hoyas needing a basket down two, Kovacikova’s pass was deflected out of bounds, causing an extended replay review. The referees ruled the ball had last touched Georgetown, meaning the Hoyas would likely have to send the nation’s fifth-best free throw shooting team to the stripe. Thompson inadvertently picked up her fifth foul off the ball, making her the third Hoya to foul out after White and Smith. Meanwhile, Stonewall hit one of two free throws to make the score 72-69 with 29.5 seconds left. Now it was DePaul’s turn to unintentionally foul, as they sent Venson to the line before the ball had even been inbounded. The Hoyas then immediately fouled once the ball found Millender’s hands on the ensuing possession, but she hit both to restore the three-point margin. Venson had the ball the whole way on the Hoyas’ potential game-tying possession, and she tried to shake her defender at the foul line extended with a step-back. Her shot missed short, however, and Held came up with another clutch late play, pulling down the rebound and hitting both free throws to put the game to rest. DePaul shot 47.3 percent in an impressive offensive performance, while taking advantage of the Hoyas’ 26 personal fouls by going 80 percent from the charity stripe. After two valiant efforts against the first and joint-second teams in the Big East on their Midwest road trip, the Hoyas will unfortunately head home with no wins to show for it. 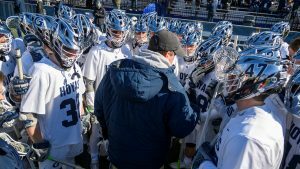 Georgetown has five days off, and will play next on the road against Villanova (15-9, 6-7 Big East) on Saturday. Tip-off is set for 1:00 p.m. ET and the game will be broadcast on Fox Sports 1. In addition, the game can be streamed on FoxSportsGo. For continuing coverage of all Georgetown sports, follow @GUVoiceSports on Twitter.